Harambee stars before the match. Gor Mahia midfield ace Kenneth Muguna played his first international match in a friendly match against Mozambique on Sunday. Muguna made the starting line-up and was impressive and national team coach Stanley Okumbi was elated at Muguna’s performance. Muguna was satisfied with his performance. 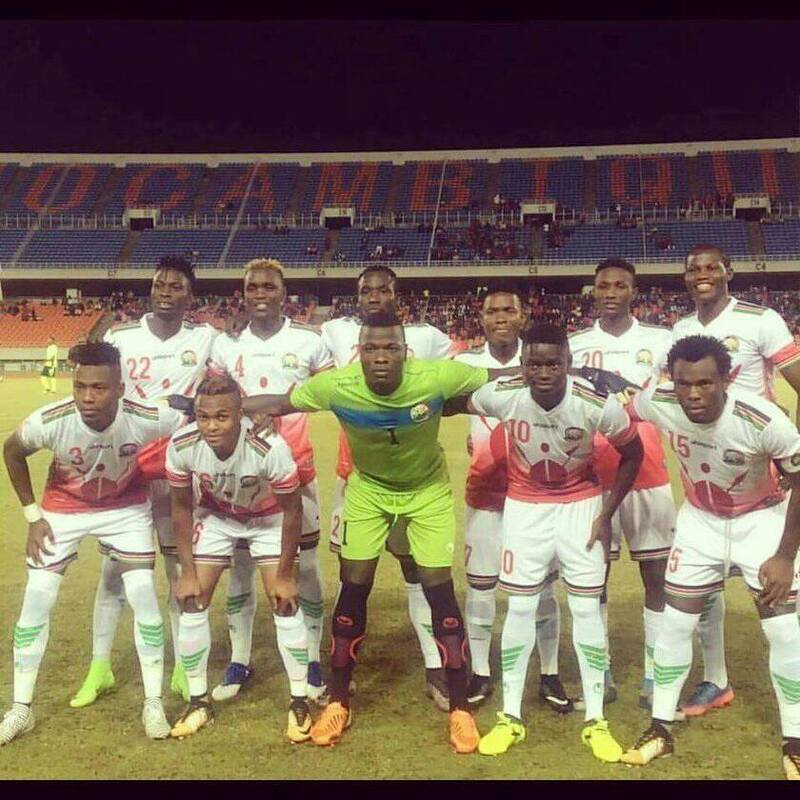 “It was an honour to make my national team debut yesterday against Mozambique. An important step and a great learning experience. Thanks for your support. Always,” he said on his social media pages. Also in action was George Odhiambo Blackberry who was making a return to the national team after several years. Odhiambo first made his international debut as far back as 2008 when he was barely out of secondary school. At the time, he and Kevin Omondi, both recent school leavers, were seen as the most promising players in Kenya But whereas Blackberry has resuscitated his career, Omondi has disappeared into oblivion. The match ended 1-1. Sweden-based Eric Johanna scored for Kenya in the 85th minute to cancel out Domingues Pelembe’s 59th minute goal. Former Gor Mahia attacker Michael Olunga is set to play in Spain’s top tier with Girona FC. Olunga will be temporarily leaving the Chinese league where his sojourn did not work out as expected. “Michael Olunga joined Girona FC in the last hours of the transfer window, joining on loan for one season from Guizhou in China,” tweeted the Swedish based agent and founder of Global Soccer Management that handles Olunga among many others players. Girona, which was promoted to La Liga at the end of the 2016/17 season, also the acquisition. “Olunga will complete the Girona attack on the historic premiere of the team in the highest category of Spanish football. The player joins Guizhou Zhicheng of the Chinese Superliga,” a statement on the club portal read. Olunga becomes the second Kenyan to play in La Liga after MacDonald Mariga. Aiiiih come on Jakoyo, come on Musymo, BFB, Dan Original, JASEGO, kwani mnacelebrate nini for so long. Come out and chat here. Walu was also outstanding for Uganda against Egypt, makes us proud. JTG I have been held up on some engagements but soon will be done. Will be back to cheer, mourn, castigate and praise as occasion demands. Jaja Was at it again and showed salah dust. well done jaja. JTG, personally I am not celebrating , but strategising how to protect Justice Maraga. Jathurgi, thanks for your concern but am also tongue twisted by the supreme court ruling which has potential implication on Kenya loosing the hosting rights for CHAN and a subsequent ban ! Big blow…..what a waste of time and friendly matches. Hopefully I should recover before our next kogallo game..
Adwa gweyo to pod aluooooooor…….adwa gweyo to pod aluooooooor………… Jowi , Jowi, Jowi. Joka nam untie… . Chande go Mara Chan wacha ikae.